Thomas Eisner became a naturalized American citizen, and applied to Cornell University as an undergraduate, but was rejected. He received his B.S. and PhD degrees from Harvard University, and joined Cornell's entomology faculty in 1957. He married Maria Eisner, who was a member of his lab. In 1964, he helped found the Department of Neurobiology and Behavior, where he worked until his death. Eisner's main body of work was in chemical ecology, primarily studying the chemical defenses of insects against predation. 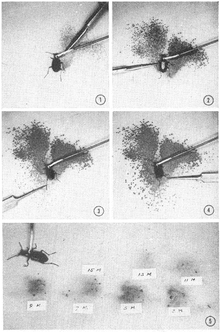 Some of his most famous work was conducted on the bombardier beetle, which he discovered creates a chemical reaction within its body to shoot a boiling noxious liquid from a nozzle in its abdomen. ^ a b "Prof. Thomas Eisner, 'Father of Chemical Ecology,' Dies". Cornell Daily Sun. March 29, 2011. Archived from the original on July 27, 2012. Retrieved March 16, 2013. ^ Kenneth Chang (March 30, 2011). "Thomas Eisner, Who Cracked Chemistry of Bugs, Dies at 81". The New York Times. ^ Gorman, James (October 10, 2006). "Eye-Catching Images of Nature, Made With a Common Machine". The New York Times. ^ Thomas, Eisner (2003). For love of insects. Cambridge, Mass. : Belknap Press of Harvard University Press. ISBN 0674011813. OCLC 52047487. ^ "The President's National Medal of Science: Recipient Details". National Science Foundation. Retrieved August 21, 2018. ^ Vega, Fernando E. (September 2004). "Review of For Love of Insects by Thomas Eisner; foreword by Edward O Wilson". The Quarterly Review of Biology. 79 (3): 314–315. doi:10.1086/425795. ^ Nedvěd, O. (2007). "Review of Secret Weapons: Defenses of Insects, Spiders, Scorpions, and Other Many-Legged Creatures by T. Eisner, M. Eisner, and M. Siegler" (PDF). Eur. J. Entomol. 104: 310.